PICK-UP DAY. With the main body of troops already onto their next gigs a few of us stayed behind to mop up the bits of scenes we’d not had time for – Jon’s hand collecting Euros at the Sitges beach table, the car’s brakelights going on as it stops at Snappers trailer. It was a beautiful day and I just wanted to sit in the sun and watch the clouds drift over the salt mine as Pao hauled his video station around and Joan fiddled over exposures and screen directions. A chopper flew in from Barcelona and we tied a wooden dummy dressed in Victor’s clothes to a rope ladder and shot it as it flew backwards and forwards in front of the castle. The locals rang up the Police to report that those crazy film people were making a man hang from a helicopter and they were scared he would fall off – I suppose the dummy looked real then! After lunch we returned to the castle in the clear autumn air and finally the tension of the last weeks started to slip away. In the ancient courtyard we built a shower head and shot the water coming on – another missing shot from our Monday from hell at the Olympic Stadium – some tourists wondered by obviously confused; why would a film crew drive all the way from Barcelona just to shoot a shower head in this beautiful spot? With some final details inside the chapel it was done and we bundled into the car to drive home to Barcelona in the dark. The wrap party was in a club off the Ramblas and rightly I felt somehow excluded – this is a celebration for all the crew members great and small who have worked so hard over the recent weeks. Status and experience mean nothing here as it is about life and joy and, because we’re in Spain, drink and cigarettes! David Gant (Victor) danced expertly with one of the ladies and I talked with Joan and his wife who has seen little of her man over recent weeks. As the music got louder and the tables were pushed to one side I disappeared and made my way home leaving the crew to do what they’ve been dying to do for a month – raise some hell without me shouting at them! It’s been nine weeks since we finished shooting and at last I’m going home. It’s been an interminable period of hard work, impatience and boredom. Significantly most of the hard work has been done by others and it seems all I’ve done is sit around and drink cups of tea and eat mince pies and yet the process has gone rather smoothly and is actually ahead of our original schedule. Last week we showed the band the movie for the first time and, even though the picture was locked and we couldn’t change anything, I was anxious for their approval. They laughed and giggled all the way through and as the lights went up their big smiles let me know I hadn’t betrayed their trust. Making Seeing Double has been a frantic and intense process – all film-making is – and as I sit in the airport I’m still trying to get some perspective on it all. When we started rehearsing in that ugly hotel room back in September I said to the band: “This film isn’t about making the critics happy and I can tell you now what the reviews will be like.” Now, as the final touches are executed I’m intensely proud of our mini-epic which spanned the oceans and the seasons. We set out to have some fun and create a fine piece of entertainment that will appeal to SClub fans and non-believers alike and our mission is nearly completed. It’s not Hamlet and it was never meant to be – I wanted to shoot a movie that would give someone the same thrill I had when I saw Summer Holiday in the Cromer Odeon when I was 10. But no matter what I say there’s only so much spin one can create – eventually it comes down to the viewer and I just hope they will get the chance to make up their own minds. A few weeks ago Mark alerted me to a posting on a popular entertainment industry web-site that alleged the band had squabbled and argued their way through the shoot and were no longer on speaking terms. What a load! I wish the writer of that piece could have seen the six of them cuddling together that Friday night at the castle, sharing a cigarette, giggling and laughing together with the easy intimacy of three year olds and the deep trust of mature adults who’ve travelled the world together. When the movie is complete my relationship with SClub will be over – it will be a sad day for I have come to love them all. I’m sitting on the tarmac and I’m ready to go home. Lord Of The Rings – Twin Towers stuff is everywhere, on the tube, on the TV, in the paper. I’m flying Air New Zealand and as I sit back in my seat the steward announces: “Welcome to Air New Zealand Flight 001 – your official airline to Middle Earth!” My dearest Christmas request for Jo, Jon, Hannah, Tina, Brad and Rachel is that the distributors will now take the baton for SClub and for SClub what others have been doing for Frodo Baggins. DAY TWENTY – SCLUB AND CLONE SCLUB DANCE THEIR WAY OUT OF TROUBLE (AGAIN) AND FOIL VICTOR’S DASTARDLY PLAN. Like the last day of term you normally look forward to the end of the shoot with such joy and anticipation but I arrived on set full of dread – so much to do. I draw a 2 inch square post-it drawing for each set up we need to accomplish and, though people swear it’s helpful, they joke incessantly about how many little squares there are up on my board at the start of each day. The grips and sparks look over with furrowed brows – each scribble represents hours of toil and sweat for them. After a full morning’s work we seem to have only removed a quarter of today’s sketches. As I think it’s now official I can reveal that the big dance scenes have been a trial for us all because of Jo’s back. She has been in serious pain for some months and we’ve had to exclude her from the big numbers which is a bit like playing in the world cup final with Beckham making tea in the changing rooms. The band miss Jo, Jo hates not dancing and I hate having to come up with useful solutions to explain her absence. Jo has fought through the pain like the trouper that she is and the band have rallied protectively around her like 5 extra brothers and sisters. Of course we went into overtime and the pile of discarded post-its was as large as the pile of completed ones until we wound up back at the big table to shoot a small scene with Gareth Gates. It was Gareth’s second day in Spain with us and though he was nervous he delivered his lines with panache and then suddenly, finally it was all over. I felt punch-drunk and delirious and stunned that the movie had started let alone finished, the band were all smiles and hugs as I slipped away to the hotel’s dining room. I didn’t want to say goodbye because…I didn’t want to say goodbye: I remember how honest the band were with me at our first rehearsal and they’ve never failed to listen and trust me the whole way through even though sometimes I didn’t fully trust myself – I’m going to miss their smiles and giggles and the way they all yell “We’re on a mission!” whenever I ask them to but, as Clone Alistair put it the other day: “This, my little pop chums, is the end of the line!” Within an hour of wrap our wonderful team was already exploding – the band were driving back to Barcelona and thence to London, Alan was already on his way to LA, Gayla was long gone to Miami and John would soon be following her there. I couldn’t sleep and at 2am found myself in front of the TV with a bottle of beer and a bar of chocolate finally watching the dailies which were handed to me last night in a large shopping bag! I laughed and giggled and grimaced my way through hours of scenes like my own very expensive home movie and finally fell asleep exhausted. DAY NINETEEN – EVERYONE CHEERS WHILE VICTOR IS LED AWAY, SCLUB EAT SOUP WITH THE CLONES. There are only two days to go but there is so much to be accomplished that complacency is not an option – but even so we get off to another slow start. It has been a gas working with the Spanish crew but I’m finding that the local tradition of taking a 20 minute sandwich break about three hours after call is incredibly disruptive – you’re just getting up to speed when suddenly everything stops and you lose the momentum: today is no exception. As a result it takes the first half of the day to complete 30% of the days workload. After lunch we’re finally inside the grand dining room of Victor’s castle. The scene is not really that long – just a page or so – and we should be able to get straight into the dialogue but you when you’re making a movie you need to do so much more than just shoot people talking the lines and herein lies the conundrum of production – trying to envision how much time each part of the film will REALLY take to shoot. I constantly live in denial about this reality and let the AD, the production manager and producer fight out how much time to allow, but on Sunday as I pored over the script and drew my storyboards I realised that you could easily spend a morning setting up the scene BEFORE anyone speaks. Remember that marvellous crane shot in Harry Potter when you first see the dining room? It probably said in the script something along the lines of “we see the Hogwart’s dining room for the first time…” but the shot must involve 200 extras, candles, a crane move, lighting and all the bells and whistles. If only we had their kind of resources. But we don’t. Our scenes were further confused by SClub having to act as their clones AND their real selves – swapping dialogue with each other. As I read the lines of Hannah, Jo, Tina, Rachel Jon and Bradley the band played Clone Jo, Hannah etc. Then they changed wardrobe, we relit the scene and shot them on the other side of the grand table. All very confusing and exhausting and at the end we’d lost some shots. We have no choice but to pick them up tomorrow – as if tomorrow wasn’t a big enough day anyway. I take the travel bike out on a run to the East of Cardonna. Within minutes I am struggling up a hill against an unforgiving headwind and for a moment the red earth and the simple houses remind me of the coffee fields on the hillsides around Dalat. It is extraordinarily peaceful and beautiful up here. Any local coming across us over the last few days – hellbent to complete a monstrous amount of work every day inside 12 hours – must think we are insane. There is a rhythm to this remarkable scenery that seeps out of the dark earth and we are a but a bunch of selfish shock troops who have come to tilt with windmills that will never be moved by the likes of us. I feel full of joy and humility. Only two more days of work and this remarkable journey will be over already – what ever did I do to deserve the gift of this extraordinary adventure? I take the travel bike out on a run to the East of Cardonna. Within minutes I am struggling up a hill against an unforgiving headwind and for a moment the red earth and the simple houses remind me of the coffee fields on the hillsides around Dalat. It is extraordinarily peaceful and beautiful up here. Any local coming across us over the last few days – hellbent to complete a monstrous amount of work every day inside 12 hours – must think we are insane. There is a rhythm to this remarkable scenery that seeps out of the dark earth and we are a but a bunch of selfish shock troops who have come to tilt with windmills that will never be moved by the likes of us. I feel full of joy and humilty. Only two more days of work and this remarkable journey will be over already – what ever did I do to deserve the gift of this extraordinary adventure? DAY EIGHTEEN – VICTOR GOES TO HIS LAB, SCLUB ARRIVE AT EAGLE PEAK. It’s a beautiful day and the morning goes well but we find ourselves behind by lunchtime. Alan has a mantra for me which describes how film-making can suffer if you don’t keep the tempo of work right: “Gone With The Wind in the morning, Dukes Of Hazard in the afternoon!” The afternoon is gorgeous but a vicious wind has kicked up. We can see Montserrat about thirty miles to the East and the foothills of the Pyrenees about forty miles to the North so I’ll settle for the breeze – this beats 5th and Figueroa anyday. As we finish our final scene in the courtyard the band hug each other without inhibition to keep warm. They are a very close bunch who look after each other and share each other’s ups and downs without malice and I am full of admiration for their quiet determination and affection for each other. DAY SEVENTEEN – THE SALT MINE. Unsung Heroes of the Set Part 107: Video Assist. In the eyepiece of the modern film camera is a tiny colour video camera which sends a signal to the small High 8 video monitors through which I will watch the whole movie unfold. I’m always impatient to see the shot Joan is lining up and it is Pau and Roxanna’s job to get video village up and rolling for me. Whether we’re on the beach, in a hotel room or down in a mine I want that coax connected the minute the lens goes onto the camera body. They nurse the monitors and the wretched cables constantly. After years of technological breakthroughs the movie camera finally lost all the cables it had connected to it (apart from power) sometime in the late 70’s – then just a few years later video assist arrived and the cables came back. Pau and Roxanna probably have nightmares about those coax cables with their delicate junctions. I’ve been dreading this day all shoot. We have placed Victor’s lab in the salt mine which is Cardonna’s other land-mark. Access is gained only by four wheel drive vehicles which descend into a quarry at the foot of which is the entrance to the mine. To shoot a number of scenes with actors playing two parts in a confined space on a low budget in a tight schedule is nothing short of suicidal. To do it in the rain the day after a torrential downpour is whatever comes next down the scale below that. 0915 – There’s a power problem as the cables from our generator are all soaked. The walls and ceilings are oozing water and as any schoolboy physicist will tell you electricity, water and salt is an ideal combination for spontaneous, free-form and uncontrolable high voltage experiments: during the course of the day Adria and his crew will be constantly swapping out sodden cables and lighting heads keeping us one step away from disaster. 1000 – The band arrive – they love the lab. 1020 – Pau and Roxanna have their little hair dryer out – my High 8 video recorders won’t run because the humidity is so high down here and the salty water drips on their gear constantly. 1050 The rain outside is now so bad that Cardonna has been cut off from the rest of the planet (at least by phone.) 1200 We hear the rain has stopped and the sun is shining – we all wish we could go outside as it’s still raining in here! Today is also the big day for Victor who is being played by David Gant. He is an extra-ordinarily elegant man with a beard and a pony tail who appeared in Braveheart and he plays Victor with great gusto and cheeky malevolence explaining at last why SClub have been sent on such a fascinating quest. He wonders through his lab making strange gutteral sounds as he works on his character. The grips exchange curious glances. DAY SIXTEEN – SCLUB FOIL PLAN Q, BREAK OUT OF JAIL (AGAIN!) AND WE SEE VICTOR IN HIS CASTLE. After wrap last night we drove the 80km to Cardonna where we will stay and shoot till the end of our schedule. Some of us are priveleged to be staying in the 1200 year old castle where we have placed Victor’s dastardly facility. The braver and dearer souls of our beloved crew are staying in a smattering of other local hostelries in the area. But this morning I awake in my six poster bed to the sound of rain. With his customary sang froid John has engineered a miracle overnight and changed the schedule so we can remain inside but all our gear is 2 miles away in the salt mine where we should have spent the day. The problems keep on coming. The water here is really weird and Jo can’t get the shampoo out of her hair. Joan (driving from Barcelona in the morning downpour) has a puncture in his car on the motorway and the wife of Luis has been swept away in her car in Casteldefels on the coast just a kilometre away from where we shot Snapper’s caravan last week. Luckily she’s OK but the car will need a few days in the spin dryer. Remarkably, and with much humour, we are able to stage our first scene just three hours after call and finish the day with all scenes complete just five minutes later than scheduled but Alan has had to do much scene-juggling to keep us out of the bunkers. Only 23 set-ups but we got the day. Unsung Heroes of the set part 106: The Electricians. It seems that Electricians the world over look the same. They wear heavy shoes and a thick belt from which they hang their sturdy gloves, clips, pegs, small rolls of gel and flashlights. They work hard, very hard, carrying in the massive lights and and the monstrously heavy cables and its dangerous work too. By the time I am back in my hotel room tonight they will still be coiling up the equipment to pack it onto the truck. Our gaffer Adria is quiet and studious, a tall man with a dense ball of curly hair and he’s constantly shadowed by the even taller Edu who wears stripey pants and looks like a guitar player from a particularly interesting rock band. Deborah is our only lady spark. It is not unusual to see ladies doing this strenuous job and like all women she works even harder than the guys to show she is as tough as they are. She seems to work constantly, furiously, sometimes she laughs and her face creases at the eyes and she lights the set up brighter than the Wall-O-Lites she connects with her heavy cables. DAY FIFTEEN – A MORNING AT THE BEACH AND NATALIE’S APARTMENT IN OLD BARCELONA. I persuade Jon, Rachel and Hannah to dig frantically in the sand while remembering where they came from while Jo and the real Sclubbers interrogate them. Everyone delivers incredible performances that are real and full of commitment – they stay in the moment throughout the scene and I’m so impressed. I wish the script contained more scenes like this so they could flourish but all too often the soil on which their performances must grow is unbreabaly thin. The weather is kind to us and we pick up the close-ups for the unfinished scene we started at Sitges last week. We finish the day shooting the band escaping from jail and I’m visibly upset again – the location has been chosen for me and is in a narrow backstreet not the spacious square I had hoped for. John (co-producer) reasonably tells me that I could have changed it which makes me just more furious with myself that I’m so English and don’t speak my mind. DAY FOURTEEN – 3 SCLUBBERS WAIT IMPATIENTLY FOR THEIR BAND-MATES TO RETURN. THEY GET ARRESTED. Unsung Heroes of the Set part 104: Drivers. Mine is called Biel and every morning when I emerge from the hotel at 530 he is sitting outside in the car ready to drive me to work and not once throughout the whole movie will he fail to get me to set by the most direct route or ontime. Today I’m very tired and grumpy and fail miserably at keeping it to myself – he tactfully ignores my mood. Tonight when I am spent and tired, maybe joyful with the days work or disappointed at an error of judgement I may have made, he will sit in silence as he drives me home. Thus, like nearly everyone else on the film, he starts before me and finishes afterwards. Luis, who drives the band to set starts even earlier and is always ready to greet us with a smile. The dashboard of his carefully tended van is festooned with glass jars filled with sweets. He obviously loves his job and one only has to look up onset and notice his happy figure, with his hands held behind his back, to get an all too brief moment of perspective. On the slopes of Montjuic, doubling for a hill on Mulholland Drive, Jo sings Never Had A Dream Come True wonderfully and her opening lines remind me of Karen Carpenter – she tells me she used to sing Carpenters tunes a lot – wish I’d been a fly on the wall for her performance of Say Goodbye To Love. Alan has persauded me to shoot the arrest scene in the park which I didn’t want to do (I thought the confines of Barcelona’s old town would be more intimidating and apt) but he reasonably points out this is the best way to slot it into the schedule. I compromise on the condition he gives me two police cars for the scene. He’s a man of his word and the cars arrive but we are running late again and I choose a compromise of the already compromised location and the cars cannot skid to a halt as I’d wanted and are hardly noticeable in the scene. As he’s a true gent he makes no comment that I’ve just wasted 3 or 400 bucks of our precious production budget. We complete 43 set-ups. After languishing in a customs shed for a month under the eye of some Iberian jobsworth my travel bike has finally arrived in Barcelona. By 9 a.m. I am climbing the slopes of Montjuic for the second time this weekend to check out tomorrow’s locations. I spent yesterday sketching out the scenes we will shoot here tomorrow and I realise I will have to revise my ambitious plans. I finish drawing at 930pm and I’m exhausted. I have made the classic error of tiring myself out trying to plan the week ahead by storyboarding every scene instead of relaxing. Seven hours before tomorrow’s call I find myself in the Pizza Hut 100 yards from Sagrada Familia wondering why I am doing this to myself. Heroes of the set part 104: AD’s (Assistant Directors). Guillermo (pronounced Gijermo) is my A.D. or Assistant Director. In many ways his is the most onerous job on a film crew. It is his responsibility that the cast are on set at the right time, that the correct props have been called for, the requisite camera equipment (cranes and steadicams etc) are available and a whole host of other details. If we are running behind his is the first name that is called on set and he’s also responsible for all the actions of the background extras. He arrives onset earlier than I do and leaves long after me. Though today is a Saturday and supposedly a day of rest he has spent most of the day with me going through the unshot scenes line by line to make sure we haven’t missed anything – in the pursuit of on-set excellence and efficiency we both felt it was necessary to spend the time and double check our already copious notes. Usually this kind of detail is taken care of in the production meeting but ours only got as far Day 10 which is long behind us now and he does not want me to be frustrated by the kind of snafus that left me so furious during the last week. I have found myself much moved in the last few days by the effort put in by Guillermo and Joan (D.P.) to give me what I have asked for on set. So often I have looked across the busy set to see them with the desperate and worried looks of lieutenants trying to martial their troops against the crushing odds and unrealistic deadlines demanded by their cantankerous general (me) but my heart warms when I see them smile – they are both wonderful men who I shall surely miss when I leave Spain. DAY THIRTEEN – SCLUB VISIT A HOLLYWOOD STUDIO. We started and finished the day in the toilet. Dawn saw nineteen of us squeezed into the ladies room where Tina KO’s Clone Hannah. Boys I have great news for you – the girls room smells just as bad as the boys does. Having played a bit part of a commercial director in 2gether I decided to cast myself against type in this film and play a music video director – not perhaps my smartest move as the day was strenuous and there was a lot to accomplish. Perhaps I should have spent the cash on someone else and concentrated on the scene more? How does Woody do it? For the second time in two days one of our locations didn’t come through the way we’d planned it. I pushed the crew with savage impatience and completed the scene within minutes in a makeshift spur of the moment substitute but was not proud that I was unable to conceal my fury. Late in the afternoon I discovered that Rachel was scheduled to leave the set to catch an evening flight to London so she could record there tomorrow. Unfortunately no-one had told Guillermo or I and there was little chance of us getting Rachel to her plane. It’s my job to get the movie made and I should be able to put all other concerns aside and say “I don’t care,” but I did. But inside I knew we were going to go late and sure enough Rachel missed her flight and the guilt stuck with me all weekend. What hurt me more was that her performance today at the security booth with the bucket of soapy water was relaxed, charming, funny and free – her best work on the movie to date. Did she hear my praise or did she think I was trying to compensate for keeping her late? Jon, who always has his lines down, is always on the case and – I have come to learn – is the rock on which SClub is built, is kind enough to reassure me that all will be well on Monday. DAY ELEVEN – SCLUB DANCE THEIR WAY OUT OF TROUBLE. Unsung heroes of the set part 103 – Props Man Miguel. If Rachel needs her cell phone, Hannah needs her glove puppets, Jon needs change for the cafe scene, it is Miguel’s job to provide it. He must keep a close eye on which props are owned by which characters and how they make their own journey through the movie. Miguel is a tall, quiet man, intense and dedicated. Today, like many days, I yell and expect Miguel to pick up the slack. Sometimes he doesn’t have the things I asking for stuff because I haven’t warned him that I’ll need it. Is it possible that my endless yelping like a whining puppy with it’s paw caught in a door jamb is making his tall imposing frame bend over at the top? Possibly. I wish I could express my thanks for his untiring work and make him laugh. His partner in crime Javier the set dresser constantly badgers me with pictures for next week’s Jeep or Friday’s ray gun but he smiles while he does it and I’m so happy they’ve got their act together. Laia and her art team have done an amazing job with the three loaves and five fishes they were given. Essentially today’s work was back to normal business for me – making a music video – and I sensed the band were happy to return to their first love – singing and dancing. They rehearse with such energy and gusto and Bradley shines as he leaps upon the table in the cell lighting up the set with his infectious smile. The dancing guards keep our spirits high until we wrap and my final image of the day is finding the hulking frame of Armando sitting on a stool in the loo, wearing only his undershorts, while he bathes each of his large sticky feet in hot bowls of soothing water. DAY TEN – SCLUB WIND UP IN JAIL. We are in Cordoniu – a famous winery 30 minutes North of Barcelona which has beautifully decorated grounds and aging brick buildings which all have the smell of fermenting wine lingering in their shadows. We have picked a huge vaulted section of the winery for the jail sequence where the band wind up after their illicit flit from the Ritz. The room is lined with wine barrels so we have changed the script accordingly and added the gag: “It’s the only jail in Spain where people are trying to break in!” We even make Armando, one of the prisoners, walk into the cell in bare feet covered with raspberry jam to create the impression he’s been crushing grapes all day. I get home to find a tape has arrived from London for me with some scenes from the movie already cut together. I stare at the package for ten minutes too scared to open it. What if the movie is crap? I haven’t seen dailies since day 2 (my copies are apparently languishing on the desk of some executive many thousands of miles away) so I have no real idea what the movie is looking like and I’m losing perspective fast – what if the tape contains untold truths that it is too late to resolve? I pluck up my courage and turn on the VCR and within two minutes I’m chuckling away at my own stuff. OK – so it’s not Gone With The Wind but it was never meant to be. S-Club are looking good on film, their performances are charming and entertaining and Joan, Laia et al are doing a fantastic job. 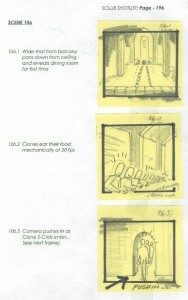 DAY NINE – SCLUB SEE THEMSELVES ON TV – THE FAMOUS FINAL SCENE. My Mum always wanted to visit Sitges and she never got her wish. But here I am on the first day of the off season stopping traffic on its famous beach. The morning started slow – everyone seemed to be recovering from the weekend and I pushed as hard as I could to the point where I felt I was driving the band before me like some driver on a Wells Fargo stage coach – whipping my acting horses into a lather with no concern for their welfare unless the scenes were completed with speed. As any director will tell you this is a fruitless way to go about your business, your job is to nourish your actors like tender flowers so that they will flourish and give you of their best. However the afternoon hung heavy on my shoulders – we were shooting two different endings for the film and I was concerned about completing coverage for both scenes before darkness fell. As the bemused residents watched over us from the small promenade my worst fears were realised and at dusk the scenes were imcomplete. For the first time on the movie we had failed to complete the day. We will now have to find time in our already packed schedule to get the extra footage we need. It might seem like the weekend but it isn’t. Over the next 48 hours I will bug Guillermo the AD on his cell phone about 30 times; half the crew will be dragged early from their beds to do a location scout; Priscilla the choreographer will create an entire dance routine and the band will have to learn it; Roger, the storyboard artist, and myself will draw more than 170 sketches and Alan, our producer, will fly 12,000 miles roundtrip just to wish his son Happy Birthday – now that’s what I call dedication to duty. DAY EIGHT – ARRIVING AT THE AIRPORT, DRIVING INTO BARCELONA, ESCAPING FROM THE RECORD STORE: Heroes of the Set Part 102 – the sound guys. Ours are called Tim, Will and Javier. As well as recording the sound we want to hear they sometimes record sound we don’t want to hear – trucks rolling by, planes flying overhead. They fight an endless battle against the picture mob (which is virtually the rest of us). “Great take!” says I, “Print it and move on.” They have to interupt me with the bad news that there was a car in the background, Brad’s neck-chain clanked, Tina banged her mic, Rachel’s mic-pack was visible etc. Today we shot in the airport and of course Tim came up to me at one point and said: “You might want to know that the last take had a plane all over it.” My droll reply was, “Sorry Tim we went all over Spain trying to find a quiet airport for you sound guys – but everyone we visited had planes.” My awful humour aside today is a very productive one – 55 set-ups. This means we moved the camera position or changed lenses 55 times – some films with more leisurely timetables might take a week to do this. DAY SEVEN – SNAPPER’S TRAILER AGAIN: Heroes of the Set Part 101 – (those of you familiar with my 2gether diary will already know about this section so forgive me Nouria et al if you don’t get a mention in the days to come as your job descriptions have already been explained in another part of the web-page.) Today’s heroes are the stand ins, Celia, Danae, Deborah, Estefania, Patricio and Rassi. Each one of them has been picked to be a double for a particluar SClub member. This means that Deborah had to have her hair cut, Danae had to have Hannah’s little end tints added and Patricio had to have his hair dyed and styled. Not only will they stand in for the band during blocking rehearsals and lighting but they will also be used for those all important over the shoulder moments the script asks for. Over the last two days I have noticed they have truly grasped what their job is about. They sprint into position when called for and they have also become firm friends with each other. The long hours hanging out on the set have resulted in some new friendships and that is a pleasure to observe. We finish up in the shower and once again, like our day at the Olympic park, it proves to be a tough scene to shoot. Bradley sings the shower song I have written for him with bravado and Tina acts up a storm stealing the scene at the end when she peers over the edge of the shower stall to peek at the clones privates – ha-ha!